Construction work is to start this spring on the first new major office development in Bath city centre for three decades – paving the way for the creation of a long-awaited new business quarter for the city. Building group BAM was this week appointed as main contractor for the 45,000 sq ft office scheme on the Bath Quays South site by Bath & North East Somerset Council (B&NES). The development, which is due to open in 2021, is already being marketed to potential occupiers from Bath and elsewhere in a show of determination from the council to stop the flow of businesses being forced out of the city by a chronic lack of Grade A space. Property agents representing clients in the city have complained for decades that what little office becomes available – usually by refurbishing older, outdated buildings – gets snapped straight away. However, the council has been able to point to the disappearance of a large amount of business space through its conversion to homes or student apartments under the government’s controversial permitted development rights (PDR) legislation, which allows developers to carry out such projects without planning consent. The Bath Quays South building is being described as providing “exceptional office accommodation” over five open plan floors with basement parking, cycle storage, showers and lockers. It has been designed to be flexible, with the ability to subdivide floors to meet occupier requirements. 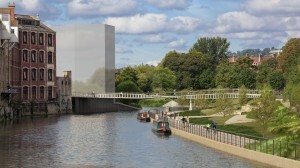 A further 45,000 sq ft of offices is to be developed at Bath Quays South in the historic Newark Works by regeneration specialists TCN, with space likely to be suitable for small firms in the city’s burgeoning creative and digital sectors – of which there is also a severe shortage at present. Enabling works have already started on Bath Quays South, with a new pedestrian and cycling bridge spanning the Avon under construction, pictured. This will link to the Bath Quays North scheme where 200,000 sq ft of office space will be developed and available from around 2023. Both developments form part of Bath’s Enterprise Zone, which is due to be extensively marketed soon with a rebrand and a strong commitment from the council that the city is open for business. Up to 9,000 jobs are expected to be created by firms moving to the two Quays sites. The scheme has been part-funded by the West of England Local Enterprise Partnership through the Local Growth Fund, administered by the West of England Combined Authority (WECA), which includes B&NES. The council said the Bath Quays project would create sustainable quality workspace; to meet demand for office space from high-value businesses in the centre of the city and to attract new employers into Bath creating a range of job opportunities. “The unique built and natural environment of Bath is internationally renowned and extremely attractive to businesses; with the highest skilled resident community in the West of England,” it said. Property agency Knight Frank’s Bristol office is marketing the new building at Bath Quays South. Partner Andy Smith said: “This is just what the city needs. The supply of quality offices in the centre of Bath has declined significantly yet demand continues to grow from both Bath-based businesses looking to expand and from companies looking to relocate to Bath. BAM construction director Neil Dorrington added: “The council has tasked us with a very interesting and very complex building scheme, and that is what we thrive on. It is a fascinating development, which requires our specialist design skills as well as our pedigree in making complex construction happen.